PRODUCT DESCRIPTION: Time released granule which will release slowly over a month or two providing both residual and repellent action. They are low to no odor, white and pretty much not noticeable once applied. 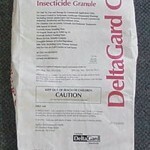 TARGET PESTS: Ants, beetles, roaches, wasps and other insects. WHERE TO USE IT: Turf, flower beds and other areas around the home and yard. 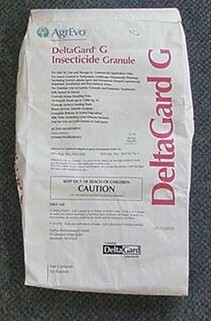 RATE OF APPLICATION: 20 lb bag treats 10,000 sq/ft. The best stuff on the market! I've been using Delta guard for years. This stuff is excellent! Will this effect a child or pet playing in the treated area? But in general, just keeping the kids and pets away when you treat and then afterward for a short while is recommended. Again, more info can be found in the video and in our safety faq's but give us a call if you need more help or any other concern addressed.